The ancestral worship, which aims to acknowledge ancestors, is a beautiful spiritual custom passed down from generation to generation. It is practised by the Lo Lo people only during the Lunar New Year festival and on the 15th day of July of the lunar calendar. Offerings to ancestors include one cow, one pig, one chicken, steamed glutinous rice, alcohol and votive papers. A pair of bronze drums, with one representing the male and the other exemplifying the female, is indispensable to the Lo Lo people. The drums symbolise the universe and human beings, and are the embodiment of gods. The solemn worship lasts for two and a half days. Young people wearing traditional costumes perform ritual dances to the rhythm of the bronze drums. At the end of the worship, the food offerings will be served to thank neighbours for their help. The Lo Lo people believe that through this practice, their ancestors will be happy in the after life and give them health and prosperity. 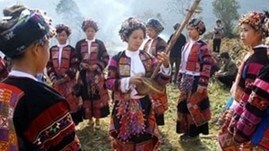 Duong Thanh Huong, Deputy Director of Ha Giang Museum, said the Lo Lo people’s ancestral worship is a unique custom, connecting family members and enhancing solidarity among the community. The Lo Lo population in Ha Giang numbers 1,506, residing mostly in Lung Cu, Lung Tao, and Sung La communes of Dong Van district and Thuong Phung and Xin Cai communes of Meo Vac district.